Mount Shasta reflects in the water of Trout Lake. The high desert is one of the most ubiquitous of American landscapes. Though there are four great deserts in America, the Mojave, Sonoran, Chihuahuan, and Great Basin Deserts, aridity remains a distinct trait of the rest of the West. The mountain regions climb high enough to absorb moisture from passing storm systems and the runoff and snowmelt from these mountains are what nurture and sustain civilization throughout western half of our country. However, below the mountains aridity remains and these dry regions are usually referred to as high deserts, as opposed to the vast thirsty lands and distinct ecosystems of the four great deserts. Although not omnipresent, the high desert areas are often identified by the presence of sagebrush, juniper and in the southwest, pinyon pines. These plant communities are hearty and well suited to living in dry lands. Some travelers do not find beauty in the lands of dryness, seeing bleakness instead of beauty. But for those who have unlocked the mystery of desert beauty, the high desert maintains a strong and deep draw. Lake Shastina seen from the Lake Shastina Trail. 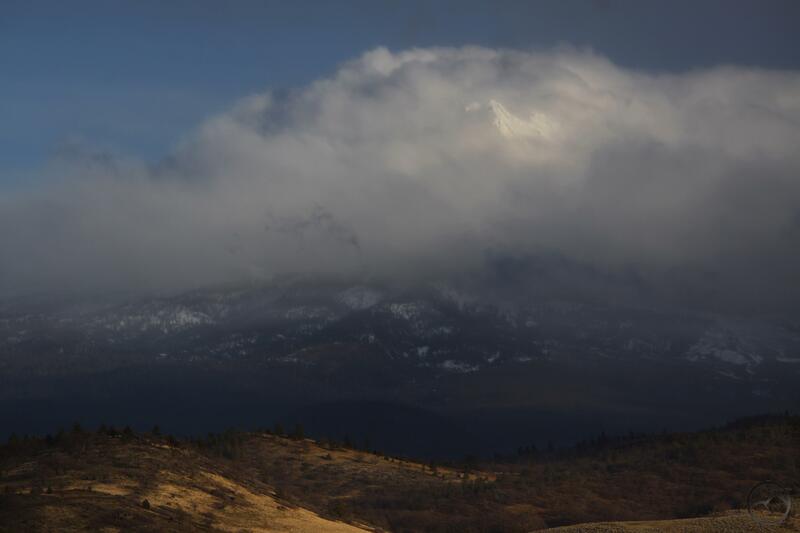 The region to the north of Mount Shasta lies in the mighty mountain’s rain shadow. The towering volcano stabs deep into the heart of passing storms and wrings the water from them, feeding the hungry glaciers and subterranean reservoirs. There is little left for the land to the north and it is left bereft of much precipitation. This dry area is mostly contained in the Shasta Valley. 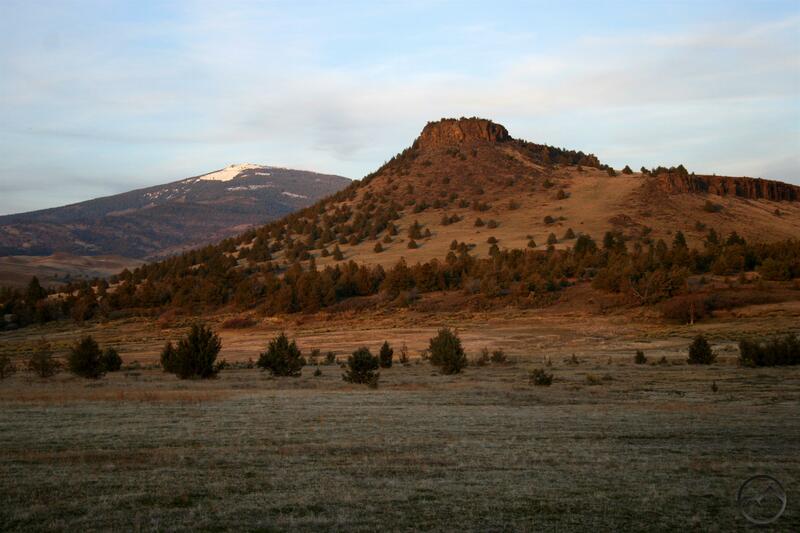 Like other western landscapes, this area is home to juniper and sagebrush, which are stark apposition to the lush alpine forests that cover the surrounding mountains. 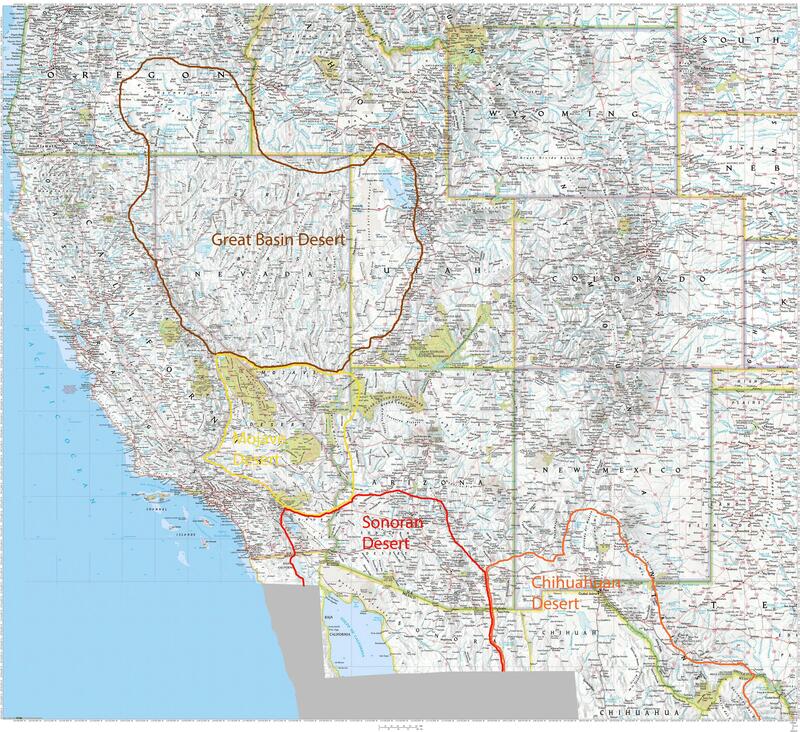 However, the Shasta Valley is not the only area where high desert holds sway. East of Mount Shasta and the Cascade Crest the rain shadow persists, but the elevation is a little higher so the high desert mixes with other environments, the juniper and sagebrush coexisting beautifully with ponderosa pines and aspens. These arid areas make particularly great places to hike in the winter and spring. 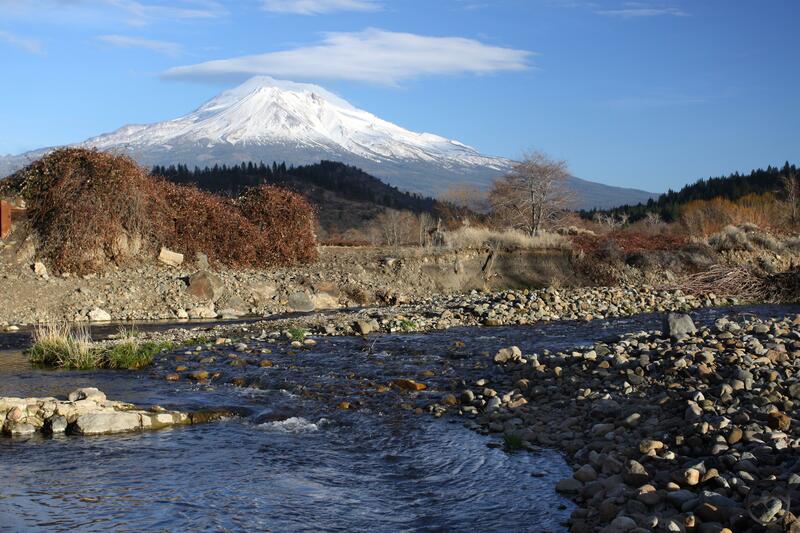 The Shasta Valley has a few noteworthy hikes that highlight the great diversity of Mount Shasta’s rain shadow. However, the most surprising feature is the presence of the water jewels of Trout Lake and Lake Shastina. Neither lake is natural, but both are glittering oasis in the land of dryness. 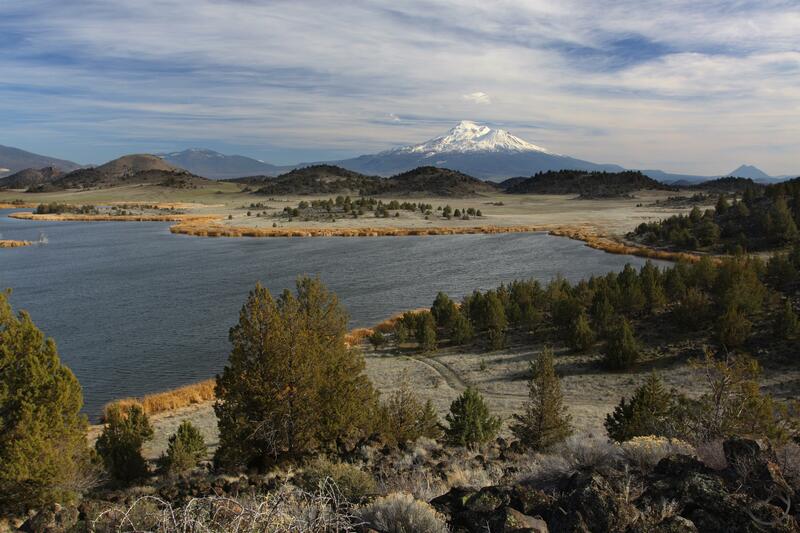 Lake Shastina is formed by impounding the Shasta River, a ribbon of life that waters the Shasta Valley. Trout Lake is a bit different. There is originally a small natural pond, fed by springs. A pair of short levees bottle up the small valley and the springs have inundated it, enlarging the pond to the lake’s present size. Both lakes are beautiful in their way, contrasting the cool blue water against the rocky, hardscrabble, high desert land. Mount Shasta dominates the view from Trout Lake. 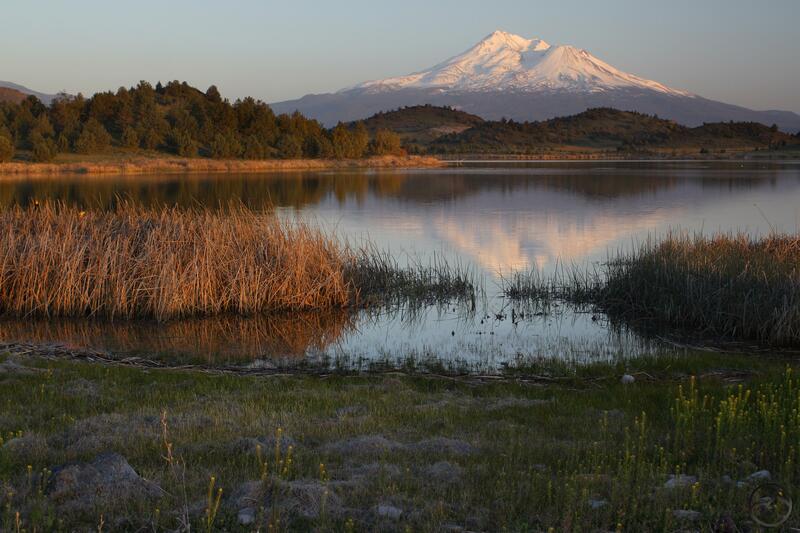 The Shasta Valley Wildlife Refuge is not well known and is a no-frills type of park. 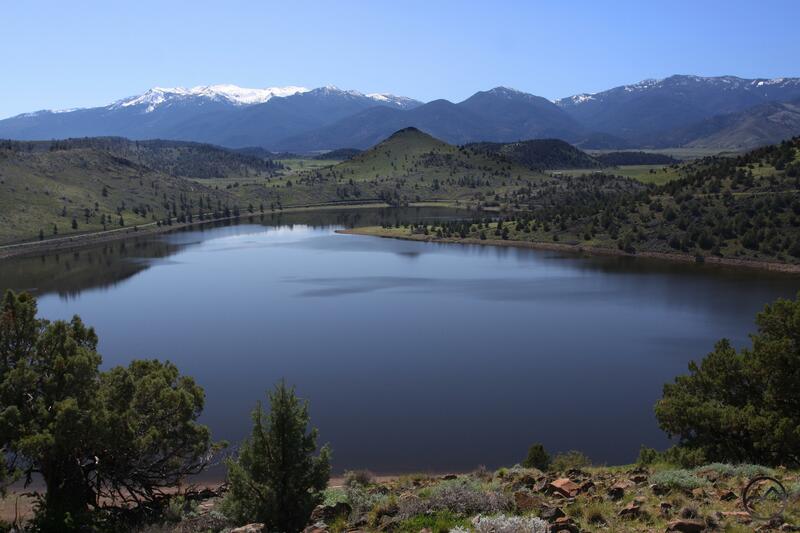 Three lakes are found here: Trout Lake, Bass Lake and Steamboat Lake. Of the three Trout Lake is the prettiest. The lake is graced with incredible views of Mount Shasta and hiking along its shores means the constant presence of the enormous mountain. 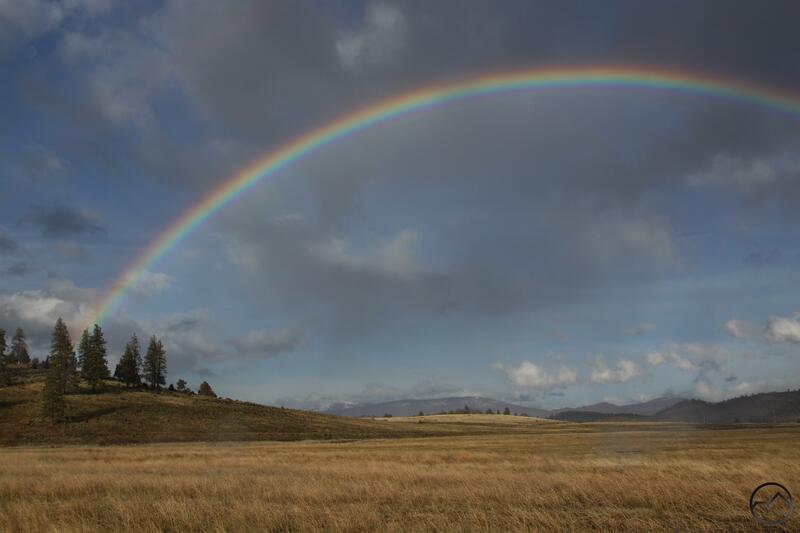 The terrain is a classic high country environment, including juniper trees, sagebrush, lots of exposed rock and expansive grasslands. Spring and fall are the nicest times of year to enjoy this area. In the spring, flowers bloom, the grasses are colored green and red and the weather is perfect. In the fall, the color gold is nearly overwhelming. The grass is gold and the reeds that ring the lake seem to glow with gold light. 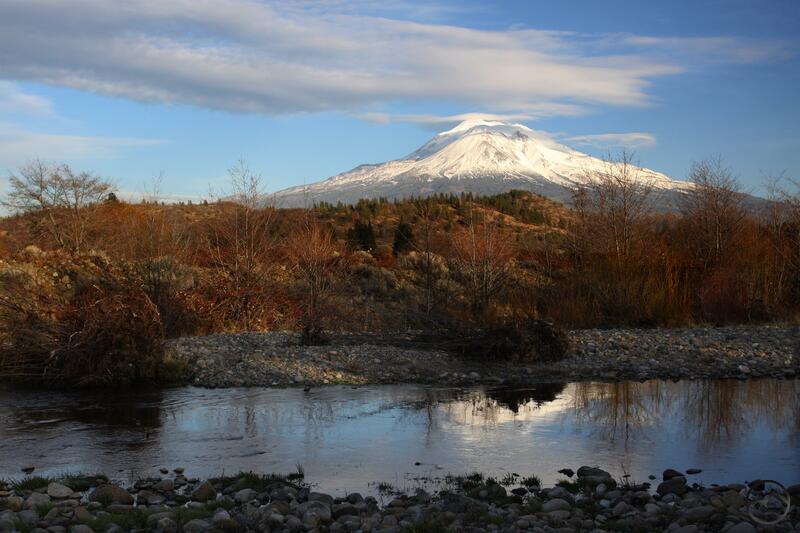 The hike along the edge of the lake highlights the high desert and offers plenty of opportunities to enjoy the beautiful views of Mount Shasta and the high peaks of the Cascade Crest, including the Goosenest and Willow Creek mountains. The Eddy Range looms beyond Lake Shastina. The Shasta River flows northward through the Shasta Valley from the flanks of Mount Eddy until it joins the Klamath River. Most of its journey passes through private land and access is limited. 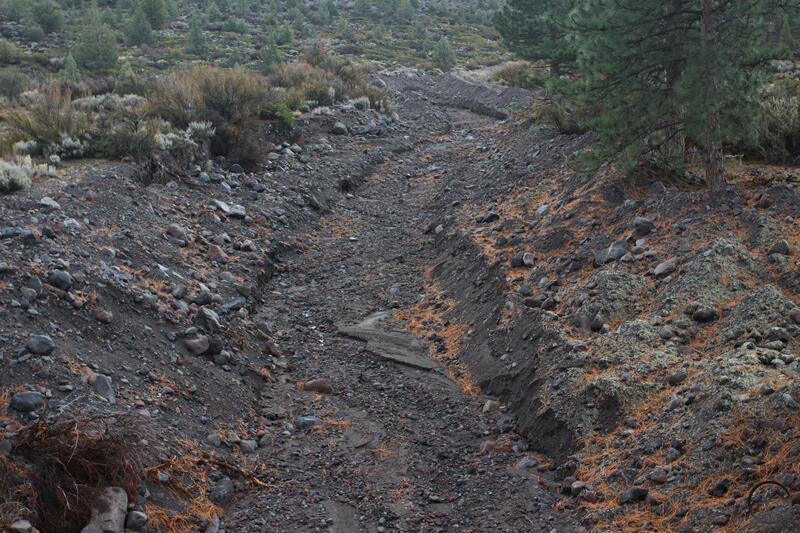 However, there is a public access area at Lake Shastina, where the river’s swift flow is temporarily stilled. Although no official trails are maintained, there is a well established route up an unnamed butte that is nearly an island in the lake when water levels are high. Despite the nearby presence of large stands of ponderosa pine, the butte is part of a distinctly high desert environment. 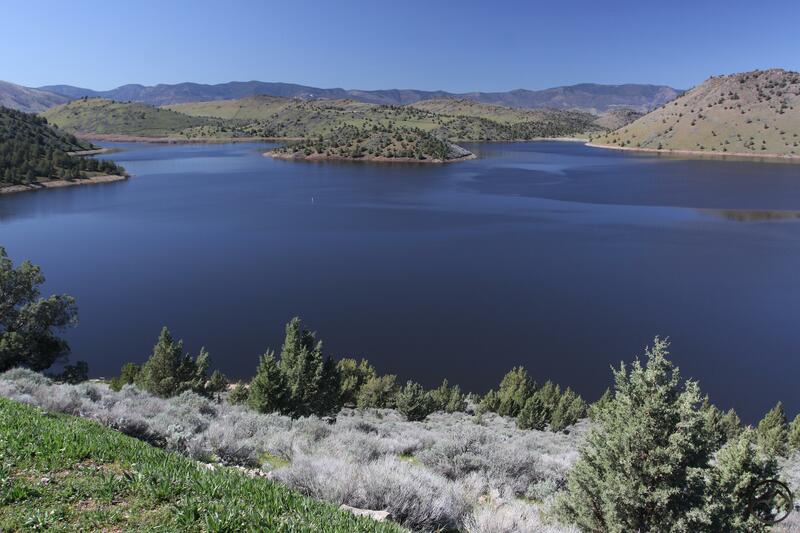 When the lake is full (it is drawn down at times) it is a glittering gem in the midst of the high desert. The hike up to the summit of the butte is never out of sight of Lake Shastina. 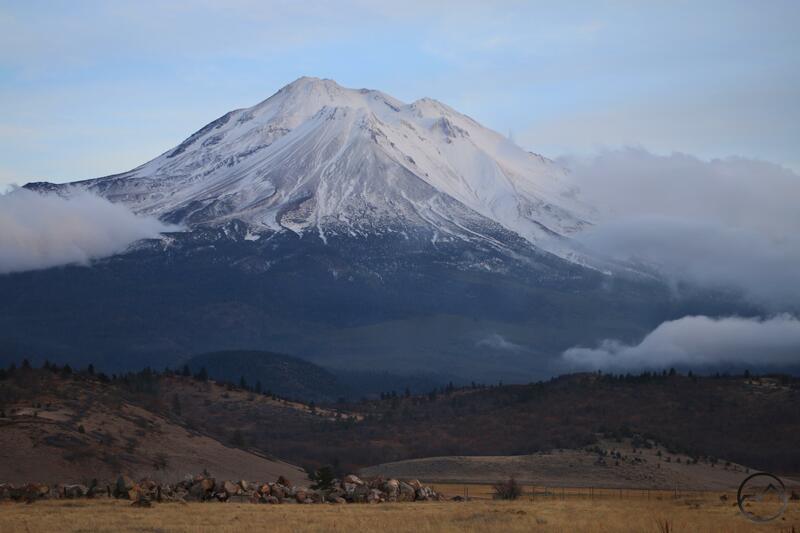 There are also great views of Mount Shasta, Mount Eddy and the Trinity Divide. Mount Shasta towers majestically over the Shasta River. 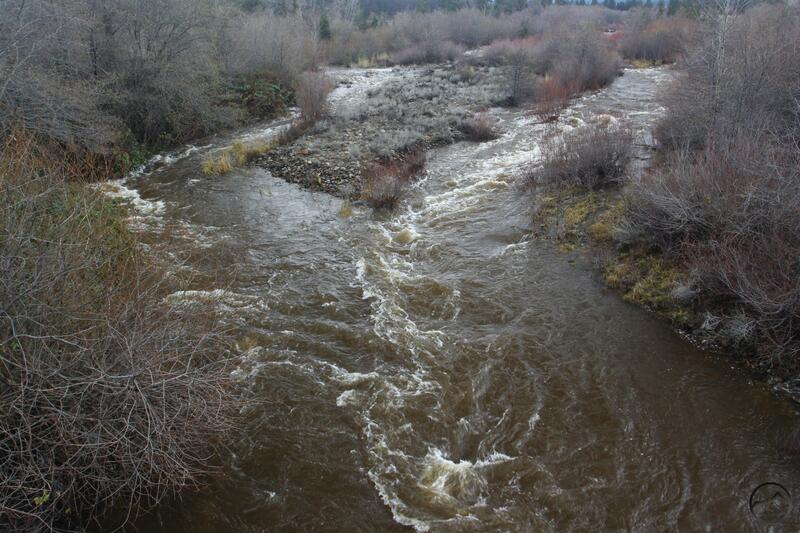 Northern California is known for, among other things, its plethora of wild rivers. Flowing freely through deep river canyons and racing through endless rapids, the rivers are the life blood of the region, gushing powerfully from the marrow that is the North State’s spectacular mountains. The foremost of these rivers, the Sacramento, the Klamath and the Trinity, are rivers of great renown; even the lesser known rivers, the Salmon (often referred to as the Cal Salmon, to distinguish it from Idaho’s Salmon River, the famed River of No Return), the Scott, the McCloud and the Pit, are still held in high regard by the fishermen and rafters who frequent their remote waters. Only a handful of dams impound the waters of these exceptional rivers. Granted, the Shasta and Trinity Dams are major stoppages on the rivers’ flow, but there are only a few other small reservoirs on these rivers. Yet among these spectacular rivers there is one that is consistently overlooked, but nonetheless delivers beautiful, albeit different, scenery. 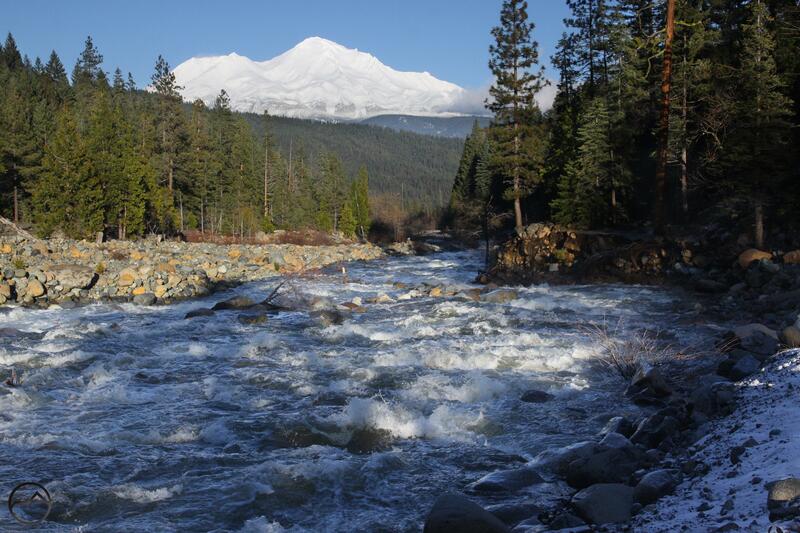 The Shasta River, one of the North State’s most forgotten rivers, is an important resource to the ranchers of the Shasta Valley, but rarely attracts those in search of beauty. Looking down on the Shasta River watershed from Mount Eddy. The Shasta River is the first major tributary of the Klamath River once the former has entered California from southern Oregon. 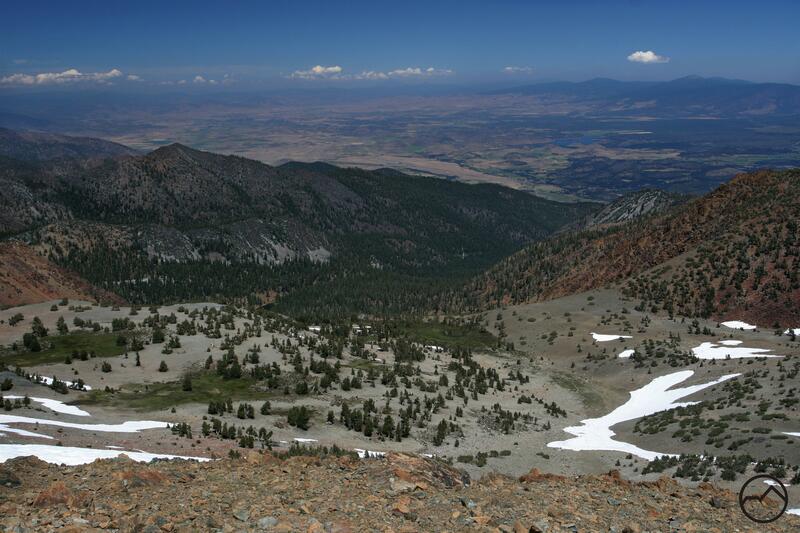 It begins on the northern flanks of Mount Eddy, the second highest peak in the Mount Shasta area. 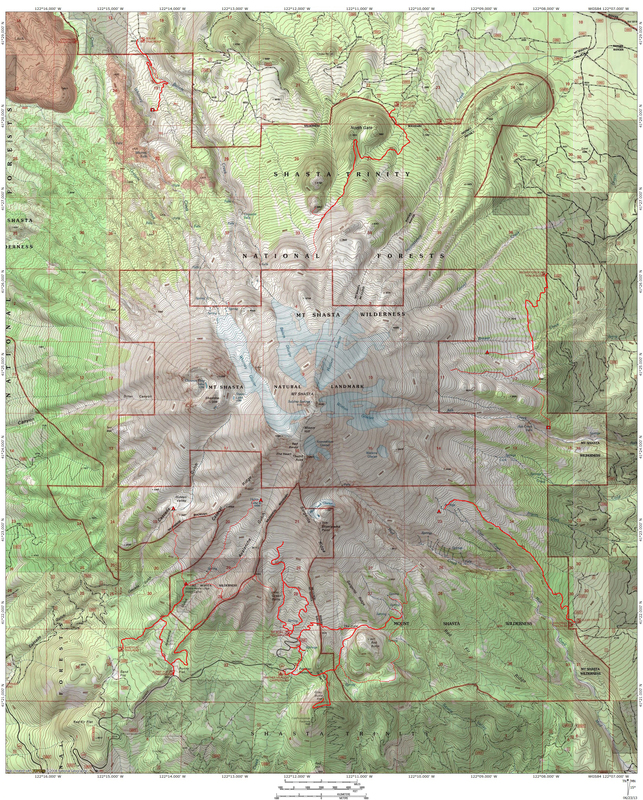 It is not often noted that Mount Eddy is a triple divide peak; waters flowing off the mountain’s summit are divided into the three watersheds of the Sacramento, Trinity and Klamath Rivers. Emerging from a series of springs scattered around Mount Eddy, the Shasta River flows north, descending into the Shasta Valley. 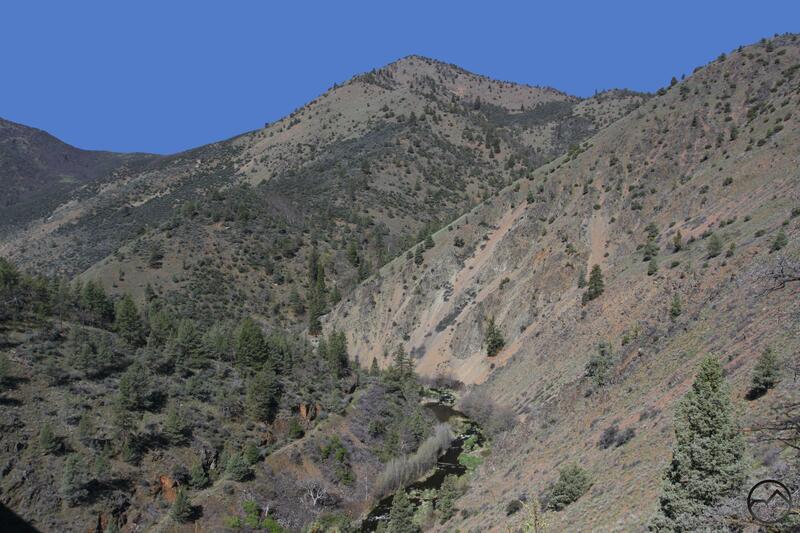 Early maps identify Dale Creek as the Middle Fork of the Shasta River. This means that Eddy Creek would be the North Fork and the South Fork would be the current branch that rises on Mount Eddy. Though the names have changed, these creeks all swell the river at the beginning of its journey. 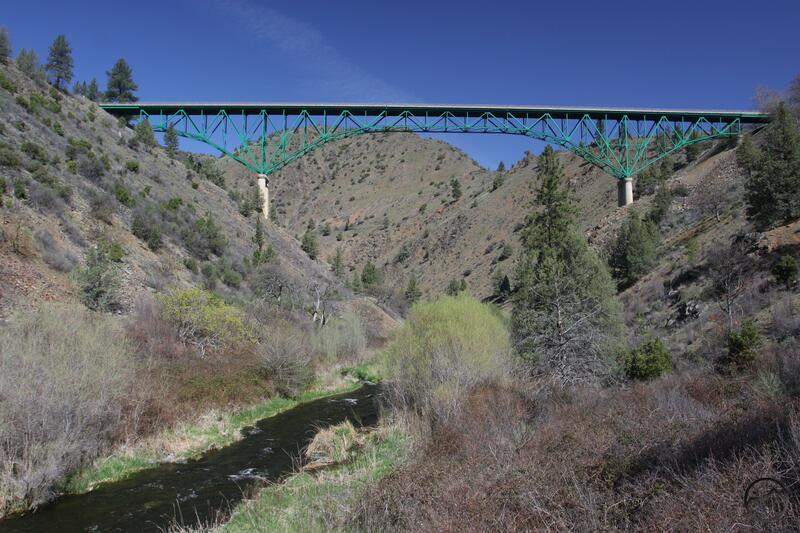 After making an unheralded passage under Interstate 5, the river flows past the small town of Edgewood and is soon stilled by the Dwinnell Dam, which forms Lake Shastina. This is the only impoundment of the Shasta River. Beyond the dam, the river meanders north, through the Shasta Valley. Unlike most rivers in the North State, the majority of the Shasta’s course is characterized as high desert. Sage and juniper are common here, where most of the other rivers have a riparian environment or a more alpine mix of pine and fir. Consequently, the arid land gives the Shasta River an atmosphere that is more akin to the northern half of the Deschutes River or the Malheur River, two of eastern Oregon’s high desert rivers. It may be a dry land but it does not lack beauty, enhanced all the more by the overwhelming presence of mighty, glacier-clad Mount Shasta. The great mountain can be seen from most of the river’s course. Ironically, the massive volcano contributes no water to the Shasta River. 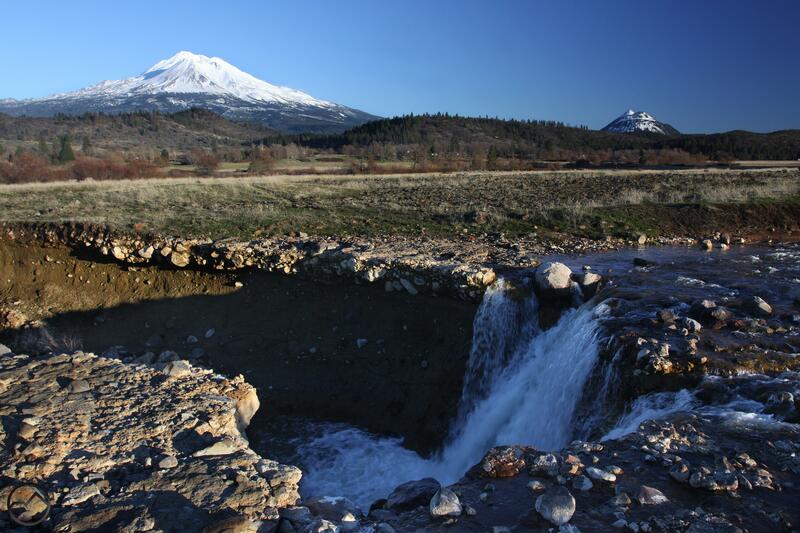 What little water flows north does so primarily through Whitney Creek, which typically dissipates into the parched, porous land of the Shasta Valley long before it reaches the Shasta River. Willow Creek Mountain and Table Rock, landmarks along the Little Shasta River. While making its northward journey, the Shasta River is eventually joined by the Little Shasta River, the largest tributary of the Shasta. Although a rather diminutive waterway, the Little Shasta River makes an impressive trip of its own. With its source in the large but seldom visited Little Shasta Meadow high on the flanks of the Cascades’ Willow Creek Mountain, the river makes a steep descent down the western slope of the Cascades. It eventually enters a rugged canyon that cuts into the region between Willow Creek Mountain and the towering volcanic dome of the Goosenest. At the canyon’s outlet the Little Shasta River passes fascinating lava formations such as Solomon’s Temple and Table Rock. 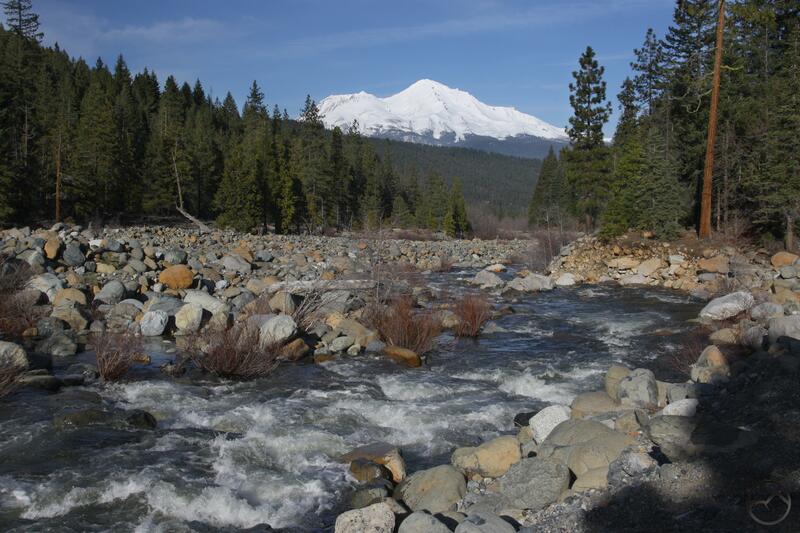 The Little Shasta then makes a slow, meandering push to the west, flowing through the northern Shasta Valley. Part of this section of its course enters the Shasta Valley Wildlife Refuge, one of the few publicly accessible areas in the entire Shasta River watershed. 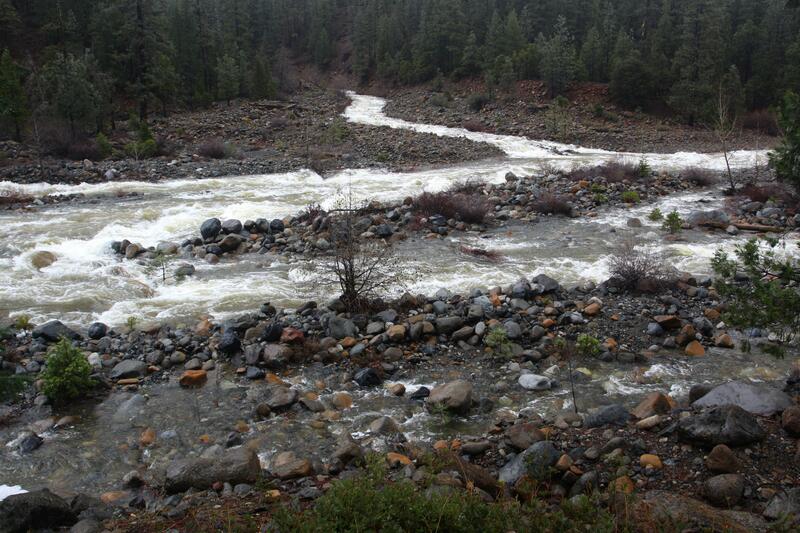 It finally arrives at its confluence with the Shasta River just south of Montague. The rugged Shasta River Canyon. North of the two rivers’ junction the Shasta River continues to wind through the upper extremity of the Shasta Valley. After passing beneath Interstate 5 again, the river’s character changes dramatically. The surrounding land remains arid high desert, but rather than flowing through the broad Shasta Valley, it now enters the rugged Shasta River Canyon. Here the canyon walls soar over 2,000 feet above the river. The water, once a meandering waterway with occasional rapids, is now transformed into churning whitewater, twisting and turning through narrow bends and roaring through narrow, rocky gorges. It is, without doubt, the most rugged and impressive portion of the Shasta River. In the 19th century this region was mining country, and remnants of that heritage are scattered throughout the mountains in this area. The combination of mining detritus and the rugged, barren cliffs high above the swift moving river gives the area a feeling akin to the westward flowing rivers of the Sierra Nevada such as the Merced and the Tuolumne, where miners plied their trade in arid, steep-walled river canyons. The Pioneer Bridge over the Shasta River. Enabling vehicular passage through the Shasta River Canyon marked a major achievement in road engineering. The original route connecting California and Oregon passed through the canyon on a dirt road at the bottom, alongside the Shasta River. In the late 1920’s increased automobile traffic demanded a better route and the current route through the canyon was built. Over 200 tons of TNT were used to blast out the road’s route, and four large bridges were built to straighten the highway out (one bridge is an unsung twin to the famed Bixby Bridge down in Big Sur). At one time this was the most heavily bridged section of road in California. Initially the route through the Shasta River Canyon was part of Highway 99, but the arrival of Interstate 5 relegated the spectacular road a backwater, seldom used except by locals looking to bypass the freeway. Today this section of old Highway 99 is designated Highway 263. It follows the Shasta River through its awesome canyon all the way to its rugged confluence with the mighty Klamath River. Mount Shasta reflects in the waters of the Shasta River. Public access to the Shasta River is unfortunately limited. Most of its course travels through private property. In the Shasta Valley, only a few isolated railroad crossings provide good access to the river. The stilled waters of the Shasta can be reached at Lake Shastina. This is best done from the public campground on the lake’s south shore. On the occasions that the lake is dry, one can hike out onto the dry lakebed and enjoy the river. One interesting feature is the Nature Conservancy’s Big Springs Ranch Preserve. Several miles of the Shasta River flow through the ranch. This area is particularly attractive, since it races through some shallow but scenic, rocky canyons. Access to these lands is limited and can only be done when the Conservancy allows guests. 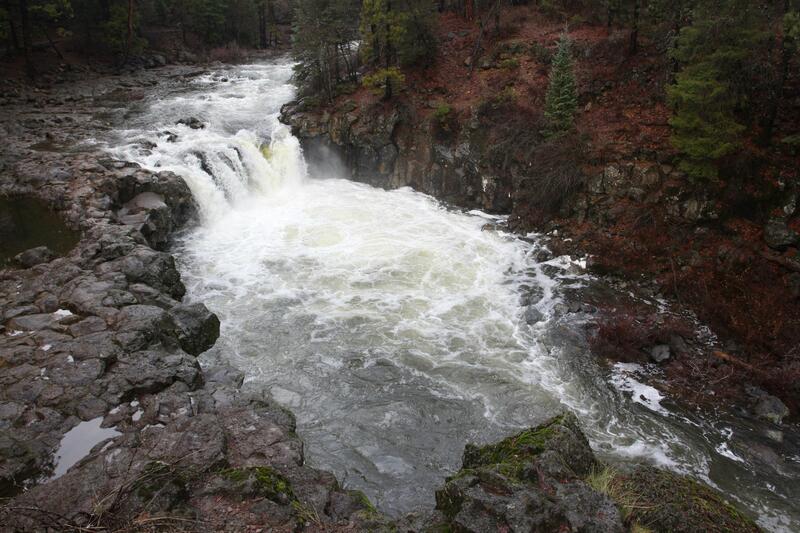 Hopefully the area will be made open to the public, much like the Nature Conservancy’s McCloud River Preserve is open to hikers and anglers. Further north, those motivated to enjoy the Shasta River’s wild passage through its awesome canyon are blessed with some utterly forgotten but excellent hiking options. Several miles of the river in the heart of the canyon pass through public lands, and hikers can enjoy an epic trip through a tremendous but nearly unknown river canyon…but that is a post for another day.